Facebook/Sequoia and Kings Canyon National ParkThe apology note, with Sequoia cone attached. Last week, officials from California’s Sequoia and Kings Canyon National Park posted a Facebook photo of a note they received from a young visitor, who returned a pine cone he or she had picked up near the 267-foot-tall sequoia known as General Grant. 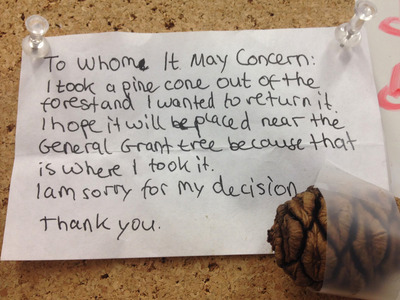 The post explained that it’s actually a sequoia cone, and that it’s important to leave them in the park because they provide food for animals and help create soil when they decompose. It’s a good reminder of an old rule of thumb for exploring the outdoors: take only pictures, and leave only footprints. And if you do take more than photos, it’s never too late to say sorry.